Comics are making me crazy. I’ve been trying to use the ipad to read them because, from a purely technical perspective it’s a fantastic tool for it. The screen is big and readable, and the form factor makes it easy to flip through. Unfortunately, the actual experience is lagging behind the technology something fierce. In an ideal world, I figure i could hear about something cool in comics (like a recent Walking Eye podcast made me curious about the current run of Detective Comics) and I could, y’know, go _buy_ it. But apparently, that’s crazy talk. If I buy the right app (of the half dozen or so out there) then I can buy some old issues of DC, without any reference information regarding things like when they came out or where they stand in the grand scheme of things (since God Knows you can’t have a big DC or Marvel title without it being tied into fourteen crossovers a year). Crazier still, some titles stay at least semi current, others just have random gaps, and there’s absolutely no logic to it. I’ve had better luck with smaller companies. If nothing else, the ipad has been great for getting my Ed Brubaker fix on, since it allowed me to get Criminal, both runs of Sleeper and the First Incognito run in big chunks. Similarly, despite the fact that I’ve grown a little middling on the BOOM! titles I follow (Irredeemable & Incorruptible), I remain hooked because they at least show up for purchase at regular intervals. This should be a fantastic chance for the smaller publishers. 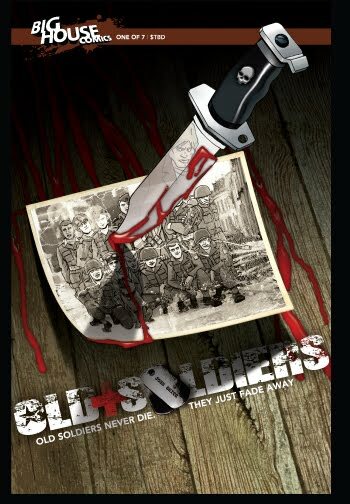 The utterly ham fisted way that the bigger companies are handling the ipad market seems to scream opportunity, and I had an opportunity to look into it when a comic I had been waiting for came out, Old Soldiers, from Big House comics. (This is the one with the ARG I talked about a while back). As it’s published by a small label, I ended up having to hunt down yet another piece of comic viewing software, Cloud 9 Comics. In some ways, it’s even worse than Comixology’s Comics, but that’s really a turtle’s footrace of a comparison. Short form: despite the software, I got my hands on the comic. Was worth it, though. Old Soldiers #1 is one of those multi-threaded stories where you open up getting a view into several different windows at once with only some of the information necessary to thread it together. It’s a tricky schtick to pull off, but Stone (the creator) does an admirable job of keeping things grounded. There are hints at the edges of some weirdness afoot, but the only weirdness we actually see (one character having a dream) is well within the pale of the explicable. Doing so eludes the trap of leaning on Lost-style crutches out the gate. It’s not flawless. There’s a lettering trick used to close/transition some conversations at the bottom of the page that’s easy to miss, and there are small concerns, like some of the names being a little on the nose, but the biggest problem is essential to the form. You’re getting a lot of characters and a lot of situation all at once, so there’s a necessary amount of setup. 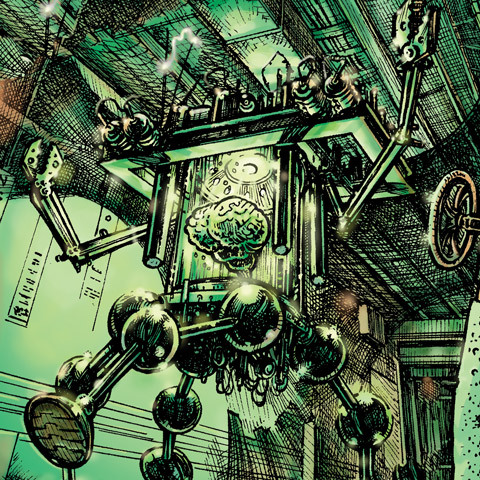 The thing is, the moments that the comic is strongest really feel like the ones where that setup is done and the author has a bit more freedom to do stuff (said he scientifically). Those relaxed moments are a big part of why I’m really enthusiastic to see #2 when it comes out and there’s a lot more freedom to take the ideas hinted at so far and roll them forward. And when it comes, I’ll almost certainly buy it digitally. For all that it’s kind of a pain, it’s still easiest for me. This entry was posted in Uncategorized on April 4, 2011 by Rob Donoghue. I played through the ARG at UnFiction attached to Old Soldiers – called “Odd Jobs for Old Soldiers”. Was very entertaining.